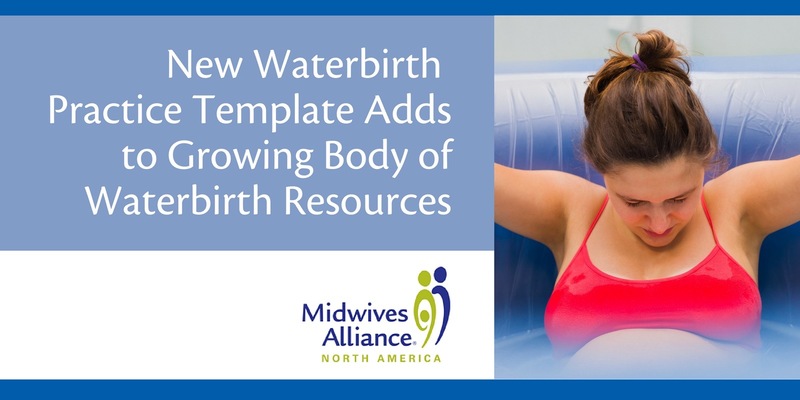 A new resource providing guidance on hydrotherapy in labor and birth is now available, thanks to a consensus of maternity care experts, including Midwives Alliance of North America. The resource, A Model Practice Template for Hydrotherapy in Labor and Birth, is a part of a growing body of resources for providers working with families considering hydrotherapy. A Model Practice Template for Hydrotherapy in Labor and Birth. This guidance template uses “the most current information and best practices available to outline various roles and responsibilities when caring for [those who] labor and/or give birth in water.” The resource was jointly assembled by the American College of Nurse-Midwives (ACNM), the American Association of Birth Centers (AABC), Midwives Alliance of North America (MANA) and National Association of Certified Professional Midwives (NACPM). You can find the tool here. Largest-ever research study in the US on waterbirth. In a sample of more than 6,500 babies born in water, researchers found that being born underwater did not confer any excess risk to the baby. Babies born underwater were no more likely than those not born in water to have a low five-minute Apgar score, or require hospitalization or neonatal intensive care (NICU) admission. The research also found no evidence that waterbirth is associated with neonatal death. This indicates that, for low-risk mothers whose labors proceed normally, water immersion is generally a safe pain management option. Find the peer-reviewed research online here and a blog post with the authors here. This position statement, co-authored by Midwives Alliance of North America and Citizens for Midwifery, brings together peer reviewed evidence and the clinical experience of midwives who provide waterbirth. It provides tools for childbirth educators, doulas, midwives and midwifery educators who need to answer consumer questions, and the most current information to help families decide what is best for them. Find the position statement here. Tools for integrating waterbirth research into practice. Learn how to use an evidence-informed practice (EIP) framework to understand the potential care implications of the waterbirth research with tools in this blog post here. From Courtney L. Everson PhD, Medical Anthropologist, Dean of Graduate Studies at the Midwives College of Utah, and the Director of Research Education for the Midwives Alliance of North America (MANA) Division of Research (DOR).